I saved the reading of this book for when I was vacationing in Italy, and I'm glad I did because it made me appreciate the setting even more. 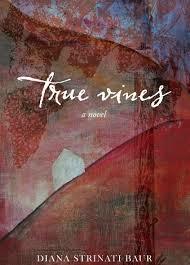 True Vines takes place both in Pennsylvania and Piedmont, Italy, but mostly in a vineyard in Italy. I loved this setting very much and the author was able to transport me there easily. The story begins when Meryl Michelli (Merla as the Italians call her) moves back to Pennsylvannia from Italy after having lived there for thirteen years with her Italian husband Francesco who dies. She returns home to a strained relationship with her sister, and the desire to start over. She finds a job at a café, moves into an apartment, and gets a makeover. The new friends she makes help her through this difficult period in her life as she learns to deal with her pain rather than run from it. There are many things I liked about this book and a few that I didn't. What I liked the most was the setting and how the story revolves around an American woman who takes on life in the hills of Italy and helps her husband live his dream of owning a vineyard and producing vintage wine. The description of the wine-making and family issues were so good it made me want to visit some of the different vineyards I saw while driving through Verona and Padova on our way to Venice. I also liked all the references to life in Italy which were vivid to me since I read this book while in Italy. The story alternates between the present Pennsylvania to Meryl's past life in Italy until it converges with her husband's death. I preferred the part in Italy more because I loved Meryl's story with Francesco and how their relationship enriched her life and helped her become the woman she was. I had some difficulty believing her quick recovery from grief and depression to begin a new relationship with a man not so well-developed in the story. Initially, I wasn't sure I liked Meryl but she eventually grew on me. She was cynical and snarky, sometimes irritating me with some of the things she said and did, but she was honest about herself and displayed generosity and resilience. Meryl's husband's boisterous family in Italy truly appealed to me with their Italian ways so familiar to me. I have to mention that my favorite character was Fredo, Meryl's little dog. This is the first time that I read a story including a dog character that I fell in love with to the point that I cried during a certain scene with him. It surprised me how deeply I felt for that cute dog! The author clearly touched my heart with her description and role of Fredo in the story. There is a lot of language in this book mainly in the form of f-words. I stopped counting after a while. It did mar my enjoyment of this book. I felt most of them were unnecessary. Overall, this is a good story with a charming setting that will transport its reader to Italy. The story has a feel-good ending and all the conflicts are well resolved, maybe a little too perfectly, but I didn't mind. It's a story about forgiveness, the value of family support, and embracing life lessons and using them to move forward. If you can disregard the language, it's worth reading. Note: This book is rated P = profanity. Lots of f-words. Disclosure: Thanks to the publisher and NetGalley for sending me this book for review. I was not compensated in any other way, nor told how to rate or review this product.